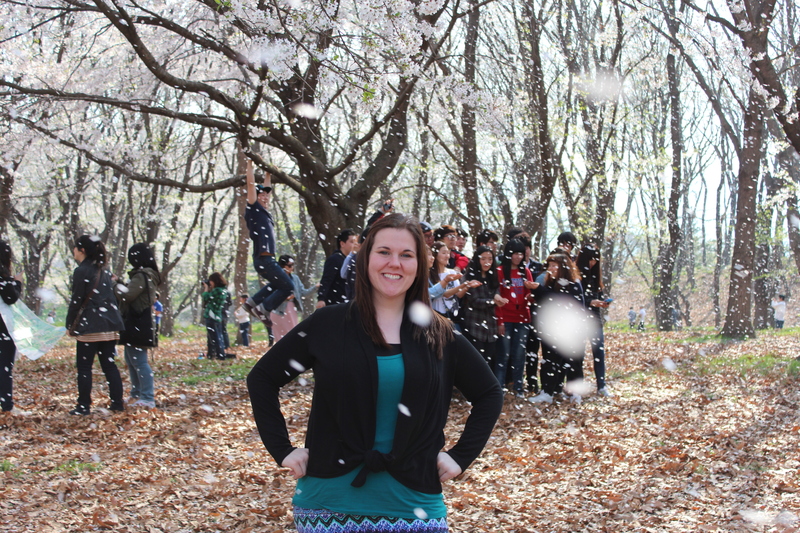 My name is Meagan and I moved to South Korea in February 2011. I worked as an English teacher in Busan for a year and a half. I left my job in August 2012 and even though I no longer “live” in South Korea, I do visit quite often on a 90 day tourist visa. I lead a pretty amazing life of travel. In 2013, I went on an international trip every month! Between travels, I stay in Ulsan with my boyfriend that works in the oil and gas industry. I am learning that expat life as a oil/gas partner is much different than that of an English teacher! Transitioning to a new (smaller) city has been a bit difficult for me, but I love my life! Dave will be working in Korea until late 2014 and I can’t wait to see where life takes us next! I want to make 2014 the year of Korea so I plan to do some extensive traveling around the country to find the best sites and attractions Korea has to offer. I taught English at a public elementary school. I applied through a recruiter (Korvia) and was hired through EPIK (English Program in Korea). If you’re interested in teaching in Korea, I recommend you read my Advice for an EPIK Applicant post and browse through my other blog posts about teaching English in Korea or life in Korea. Please note that contract details and application requirements have changed since I applied, but let me know if you have any questions and I will do my best to help. Congratulations Megan! I have been wondering about the direction your life was going. I am very excited for you. Wish you could come by to see me and Happy before you go. Hey Megan, sounds like you’re doing exactly what I want to do next feb/march, gonna start applying to EPIK this October! Looks like you’re having a great time, any advice?? 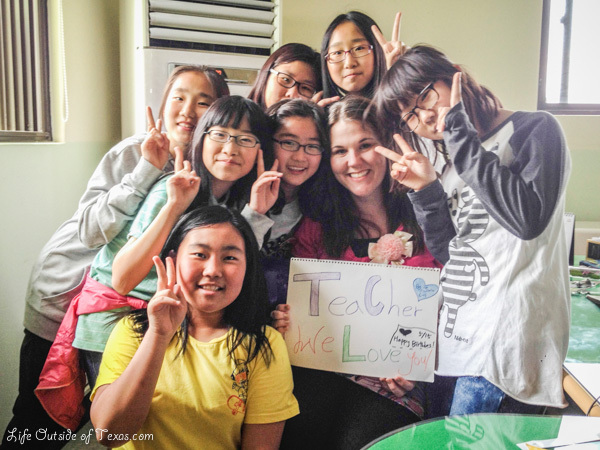 Hey Meagan, just stopping by your blog and it sounds like such a fantastic experience to be teaching abroad! Looking forward to reading more of your everyday experiences over there! I’ve only been in Korea since Sep 2011, but I’m loving it here. It’s an amazing city and a wonderful culture. I’d recommend it to anyone. Good to see another Texpat around Asia. 🙂 Looking forward to reading your entries. I nominated you for the Liebster award here http://trooadventure.com/2013/02/28/the-liebster-award/ – it’s a bit of fun, and I think your blog’s really fantastic! Thank you so much for the nomination! I have been trying to make a Liebster post, but it’s actually proving to be quite difficult for me. I really love that you thought of me and enjoy my blog. I’m quite fond of yours also. Nice blog you’ve got here. I lived in Ulsan for two year, followed by three in Seoul and just came back to the States a year ago yesterday! I miss Korea a lot sometimes, especially my friends, the expat community and that sense of being an outsider. Ironically, after five years there, I feel like an outsider here sometimes and find it difficult to integrate and meet new people! Keep up the good work on the blog and I look forward to seeing more! I’ll be here for another year, so 3 in total. It’s definitely got to be weird once you move away! I hope you get over that reverse culture shock soon. Thank so much for the kind words about my blog. I’m really enjoying yours as well! Yeah, it can be a big change for sure! You’re very welcome and happy blogging! Thank you for the follow ! I really enjoy your photos! Wow, I think the next place you should look at is Oman. With your boyfriend’s job in oil and gas and your abilities to teach, both of you could find jobs here. I worked at two elementary schools in Seongju and lived in Daegu for a year, then came to Oman and have been here for 1 1/2 years. I leave here at the end of June to return to the U.S. But I think you would enjoy checking out Oman next! You really love Oman, huh? I can’t wait to keep up with your adventures there. I’m not sure I’m going back into the teaching field any time soon, but I’m always up for exploring new places. Loved your fall photos from Korea. We don’t get much full color down here. Would love to venture out in the fall to see them. I have enjoyed Oman, but it’s a small country and I’ve seen most of it! So I am now bored with it and ready to leave. The culture is very difficult to get used to, especially for a woman. I am really ready to return to the USA, which I will do on June 26. But if you want to travel, it’s a great country to see, plus it’s not too far from almost anywhere in Europe or the Middle East you might want to travel. Great location as a jumping off point! Korea has some beautiful spots. Just try to get out of the cities, which I found boring and ugly. Sarah, you should come visit South Korea. We can go on some blogger adventures together! I loved your US pics and it looks like you had such a great time. I would love to visit Korea! It’s pretty high up on my list especially since its one of the more exciting places in the region! I was searching for an Ear doctor in Busan and came across your blog! I think I have something in my ear that needs to be removed (happened before, back home though) and so was wondering where you went when you had your ear troubles. What part of Busan are you in? This doctor is in the Minam area (on the brown/blue line). I don’t know the address, but here’s a map of the area. Hopefully that works. I tried to get an address, but google maps doesn’t work that way in Korea. Send me an email with your location and I can get you better directions. LifeOutsideofTexas [at] gmail. I’m happy to support other travel writers! You have a great site. Thanks for the comment! WHAT! 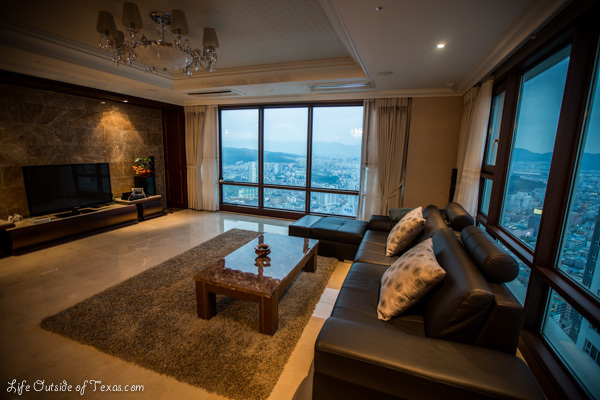 The oil/gas apartment is STUNNING!!! Ours looks like the teaching one. WHATTTT!!!! Yeah. It’s really interesting to be able to experience life in Korea from both perspectives. I really liked my little teacher apartment though! Megan -Stumbled across your web site. My wife and I are moving to Ulsan in Jan. I am In Oil and Gas will be there for 2 years. My question is are there and wives groups or Expat clubs in down town? The only one I can find is FLiK and that is down near the ship yards. We like the Apartments and style of living down town much better but we could never live down there if my wife has nothing to do/ way to meet people. I guess I should have read the comments before posting lol. Wyatt is my husband. I didn’t realized he had posted anything!! I will check out that post right now!! Thanks Meagan! Hi Meagan! My husband and I moved to Ulsan this passed Sunday! I have only ventured out of our apartment at skyrex a couple of times (the cold doesn’t make me want to go outside brrr!). I know you mentioned Tuesday coffee with several women. Do you still do that? Are new comers welcome? If so, could you please let me know where it is at? I might be able to find my way around somewhat by next week lol. I’m so glad to hear another Texan’s stories about South Korea! Thank you for writing this blog! Hey Joanna! Welcome to Ulsan! I believe coffee was on your side this morning so it should be near Exordium next week (at Tom N Toms). Anyone’s welcome and it’s a good way to meet people. I also think that there’s a Skyrex facebook page (if you’re on facebook?). Please let me know if you’d like to get together for coffee or lunch sometime. I haven’t met many Texans here. And please let me know if you have any questions. I’d be happy to help. Hope all is well. Just thinking of you! I haven’t been able to connect as much with my fast pace travels through Australia and New Zealand, but know that I think of you and hope you are well. Hey Jess! So good to hear from you. Things are great. We are actually in Vietnam celebrating my 30th (next Thurs). How are your travels? Sounds amazing! Happy early birthday! My 30th thus far has been my best year yet. I kicked it off with skydiving. I will be 31 in August. Not sure what I will do for the next bday. Travels are going great. In the process of planning my next upcoming trips. Is your apartment that bad? I didn’t mind my apartment while I was teaching. I just wish the heat and A/C worked a bit better. Otherwise, it was great!